Home » News » Announcements » Divinity Derby is now online on Kickstarter! Divinity Derby is now online on Kickstarter! Are you ready to place your bets? The crowdfunding campaign to fund the racing and betting game Divinity Derby starts today, with an initial funding goal of $12,000. The campaign will run until March 24th, at 11:00 PM CET (10:00 PM UTC/GMT). Divinity Derby is a fun and challenging game for 3 to 6 players, ages 10 and up with a clever “shared hand” mechanic. A party on Mount Olympus quickly turn into a crazy race of mythic flying creatures, where the gods bid on (and influence) the outcome of the race, with the Olympic “All-father”, Zeus, as the ultimate judge. Each player assumes the role of a god (chosen between Anansi, Horus, Marduk, Odin, Quetzalcoatl, and Yù Huáng the Jade Emperor), betting on a race among mythological flying creatures – Dragon, Gryphon, Lamassu, Pegasus, Phoenix and Sylph. Each player plays with two hands of cards, sharing a cardholder with each neighbor, conspiring against – or with – the other players. Divinity Derby, now on Kickstarter. Designed by Carlo A. Rossi, Divinity Derby will feature a colorful gameboard, six gorgeous miniatures (modeled by master sculptor Bob Naismith), over 100 cards (illustrated by Ukrainian artist Denis Martynets), card holders and tokens. 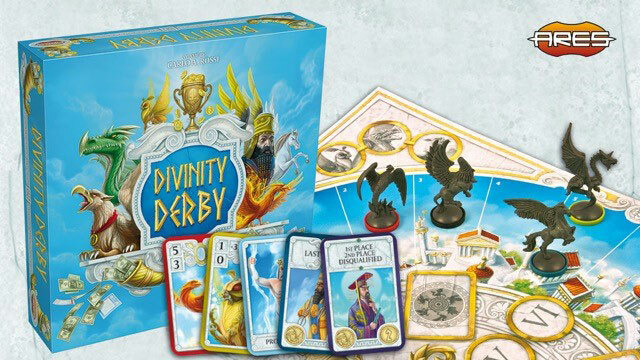 The Divinity Derby Kickstarter project offers the Standard Edition of the game, like the retail version (but sent to backers first), or a Deluxe Edition with hand-painted miniatures (only available on Kickstarter), presenting five pledge levels, and Day-1 Early Bird options. The “Demi-God” pledge is $35 (Day 1: $30) and includes as rewards a copy of the standard edition and all unlocked "Standard" stretch goals. The “Olympian” pledge level ($50, Day 1: $45) includes a copy of the Deluxe Edition of the game and all "Standard" and "Deluxe Only" stretch goals. “Pantheon” ($135) is the “party” pledge for people looking to save on shipping, including three copies of the Deluxe Edition and unlocked stretch goals. The “God of Trade” ($195) is reserved to retailers, offering six copies of the Deluxe Edition and unlocked stretch goals. Finally, a limited pledge level, “Follower of Ares” ($100) offers one copy of the Deluxe Edition of Divinity Derby (with all stretch goals) plus one copy of each of the previous games in Ares' Euro Game range – Aztlán, Inkognito and Odyssey – Wrath of Poseidon. Divinity Derby contents include six miniatures, 66 bet cards, 54 movement cards, 4 protection cards, 24 creature tokens, 6 God tokens, 1 first player token and 6 card holders. The suggested price at retail (Standard edition, with unpainted miniatures) is expected to be $40. During the KS campaign, through stretch goals and social goals, the game can be further improved with more god powers, creature powers, additional gods and contents upgrades. The game is expected to ship to backers in September 2017 from Ares Games’ main warehouse in the USA and from secondary warehouses in Australia, Canada, Germany, Hong Kong. No customs charges will apply to backers in Australia, Canada, European Union, Hong Kong or USA. Divinity Derby is the 8th project of Ares Games on Kickstarter. Six were already delivered successfully (Sails of Glory, Galaxy Defenders-Season 1 and Galaxy Defenders-Season 2, Age of Conan - Adventures in Hyboria, Wings of Glory - Giants of the Sky, and Dungeon Time) with very positive feedback from the backers. The latest project, Sword & Sorcery, got over $500,000 pledged and it’s almost completed, with rewards expected to ship to its backers within the next two months. For more information about Divinity Derby and to pledge, visit the Divinity Derby project on Kickstarter and the game’s page on our website, and follow the Divinity Derby’s page on Facebook.